The text may not be sold for profit. If you would like to use it in a class, you may provide copies to the students for the cost of printing. Please do not publish solutions to the homework problems. Please let us know if you use the text for either personal or classroom study; we would like to know how widely the book is used! 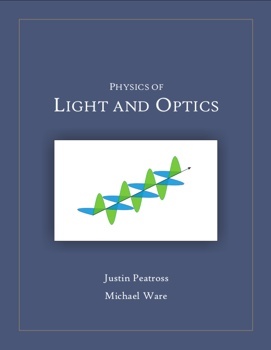 The authors (Justin Peatross and Michael Ware) welcome constructive feedback, which can be sent to opticsbook@byu.edu. While the authors retain the copyright to the book, we have made this book available free of charge as our contribution toward a future with free textbooks! We firmly believe in the free market system, and in the case of upper division physics textbooks, traditional publishing methods usually make little economic sense for the author or reader. The small royalty from traditional publishing comes with a giant overhead that make the book nearly cost prohibitive to many students (especially those in developing countries), and the author gives up control of his work to the publishing company. Electronic tools make it easy to produce and distribute a professional product (see our section on creating a textbook), and it can be revised, corrected, and enhanced on the authors' timetable. If you are thinking about publishing a book this way, we highly recommend it.